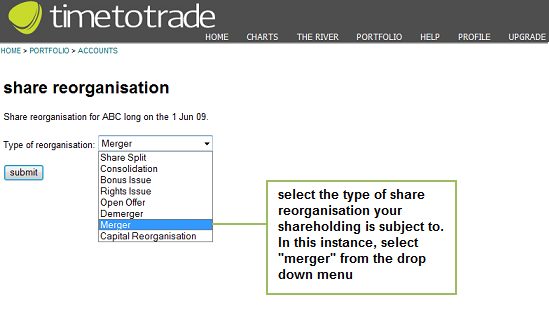 When two companies merge, shareholders in the company that has been acquired or merged into another, receive new shares in place of their existing holding. In this instance, a merger is not treated as a disposal for Capital Gains Tax purposes but instead the shares in the new company are deemed to have been acquired at the same time and for the same price as the original share holding. 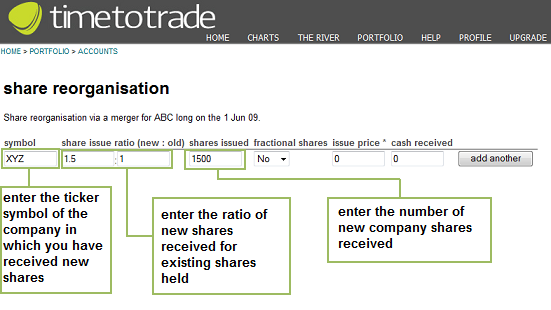 On 1st Jan 2009 you purchase 1,000 shares in Company ABC @ 100 pence per share. On 1st Jun 2009 company ABC plc is merged with Company XYZ plc. Under the terms of the merger you receive 1.5 ordinary shares in Company XYZ plc for every share held in Company ABC plc. 1000 x 1.5 = 1,500 shares in XYZ plc. When finished click the "submit" button. You will now see a summary of the details input. 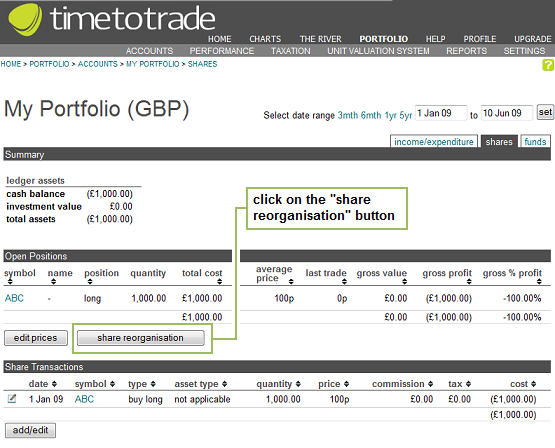 Check the details are correct, and click on the blue text "click here to return to ledgers" to take you back to your share portfolio page. 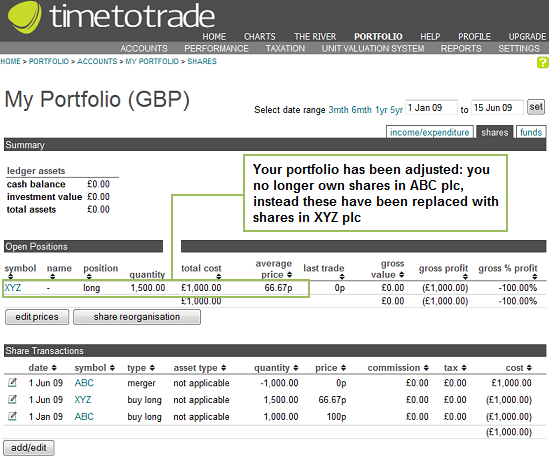 Returning to your share portfolio page, you can see that the merger transaction has been added to your portfolio and you no longer own shares in ABC plc, instead these have been replaced with 1,500 shares in XYZ plc with a base cost of £1,000 as expected.